India POS shipments volume reached 16,231 units in CY Q4 2013, an increase of 8% over the previous quarter. Epson emerged as the market leader. According to 6Wresearch, India POS (Point of Sale Systems) shipments volume reached 16,231units in CY Q4 2013, representing an increase of 8% over the previous quarter. EPSON emerged as the market leader followed by CITIZEN and POSIFLEX. CITIZEN experienced a substantial increase of around 60% in terms of unit shipments in the current quarter. In the POS Terminals, POSIFLEX captured lion’s share of the pie. During CY Q4 2013, in the printing method segment, Thermal Line Printing dominated the market, followed by Direct Thermal Transfer. However, Direct Thermal Transfer demonstrated tremendous growth in CY Q4 2013 as compared to the previous quarter. The growth of India POS market is primarily driven by increasing modernization across major industry segments such as Retail, Healthcare, Transportation and Food and Beverages. Further, increasing use of debit and credit cards is also fueling the growth of POS market in India. In printing speed, 40 IPS (inch-per-second) represented 31% market share. During CY Q4 2013, POS devices used in Retail Stores captured more than 91% of the total market share. Further, the POS market in India represents considerable growth prospects over the coming years as Indian consumers are gradually shifting their preference towards POS devices over other payment options. 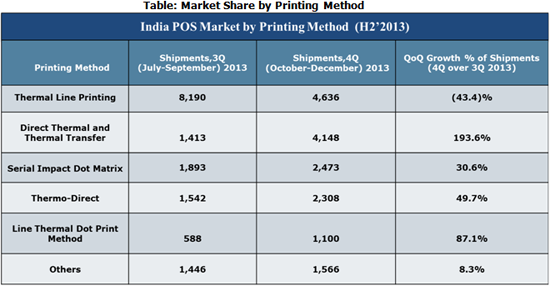 Additionally, growth of mPOS (mobile point of sale) segment will further fuel growth of the India POS market.